The Vivace Gift Voucher is a fabulous idea for any occasion and is so easy to order – you select the value of your choice and we deliver it to your recipient’s email inbox (or yours) instantly. The perfect “last minute” gift! Please note, all Vivace Gift Vouchers are subject to certain terms and conditions. Gift Vouchers are not replaceable if lost, stolen or destroyed, photocopied or altered in any way and will not be accepted by Vivace or be otherwise redeemable. Terms are void where prohibited by law. These Terms and Conditions of the Gift Vouchers are governed by the laws of Victoria. A. Your Gift Voucher is valid for a period of six (6) months (182 days) from date of purchase. In what denominations are Gift Vouchers sold? Can my Gift Voucher be redeemed for cash? A. No. Vivace Gift Voucher cannot be redeemed for cash. Are there any additional charges by Vivace for buying the Gift Voucher. What if I don’t have my Gift Voucher with me when dining at Vivace? A. You must produce your emailed or original Gift Voucher to Vivace prior to making any purchase. If you have misplaced your Voucher and are unable to produce it upon purchase then you must pay for the goods. The voucher can be used at a future date (before the expiry date),. What if I have lost my Gift Voucher? 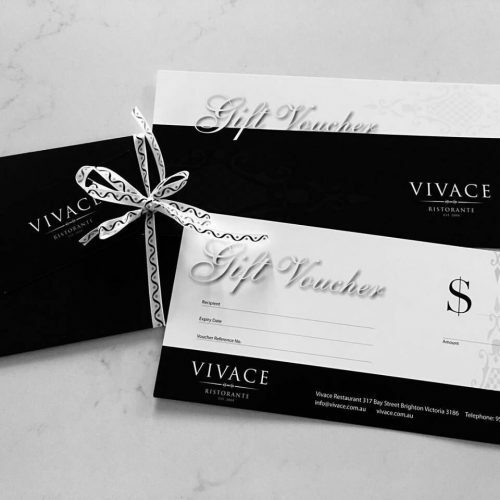 A. Vivace Gift Vouchers are not replaceable if lost, stolen or destroyed, photocopied or altered Gift Vouchers will not be accepted by Vivace or be otherwise redeemable. What if the value of my purchase is more than the value of my Gift Voucher? A. Should you spend more than the value of your Gift Voucher, you will be required to pay the difference. Vivace Gift Vouchers are subject to change without prior notice.